Rolls-Royce Wraith Performance, Engine, Ride, Handling | What Car? Press the dashboard-mounted starter button and the Wraith’s twin-turbo V12 engine stirs into life so smoothly and quietly you’ll barely notice. It’s a similar story when you pull away, because although the scenery starts to move, you remain wonderfully isolated from any engine noise or vibration. Gearchanges are utterly seamless, and because the sat-nav system is linked with the transmission, it can read the road ahead to avoid unnecessary shifts and ensure you always stay in the right gear. However, the Wraith changes character completely when you bury your right foot in the shag pile carpet; the engine bellows loudly and sends you hurtling towards the horizon at a breath-taking rate. In fact, the Wraith is so fast it’ll embarrass a Porsche Cayman in a straight line. Come to a corner, though, and you’ll quickly realise this 2.4-tonne behemoth is no sports car. When you turn the wheel there’s a lengthy pause before the Wraith’s huge bonnet starts to point in the direction you want it to go, and then the rest of the car reluctantly follows. Adopt a slow-in, fast-out approach and it’s possible to hustle the Wraith along a country road surprisingly quickly, but the inconsistently weighted steering and mushy brake pedal do put a solid barrier between you and any fun. 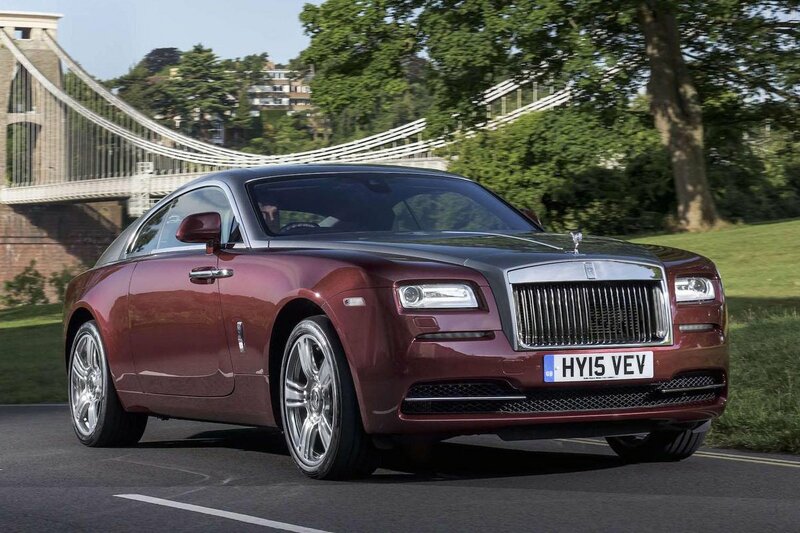 The slow steering rack comes into its own in town, though, and is light enough to make threading the Wraith's enormous bulk through traffic a relatively painless experience. This isn’t likely to bother potential suitors that much, because they’re far more likely to use the car to traverse continents on fast, mostly straight roads. With that in mind, though, the Wraith doesn’t ride quite as serenely as you might expect. It’s never uncomfortable, but fidgets around more than we’d like over minor imperfections. That’s a shame, because bigger bumps are smothered remarkably well. Motorway refinement also leaves a little to be desired, because although the Wraith’s engine remains ghostly quiet at 70mph, its frameless side windows generate an annoying amount of wind noise.